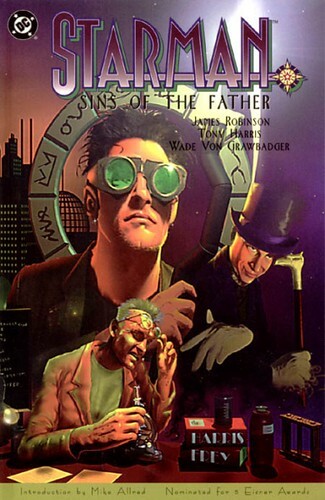 Since Smalerie has gotten us rolling on the comics front, we're all gonna share our favorite series. Since I read everything in trade paperback I can't strictly promise they're all still ongoing (and Smal snatched up Fables!) but you should still be able to get your hands on 'em. Here's my take on three series to sink your teeth into. Plot: Tony Chu is a cop. He's also a cibopath - he can take a bite from anything and get a psychic impression of everything that happened to it up until he took a taste. He tries to keep it under wraps, but when he uses his powers to solve a case, he ends up in a web of conspiracy that reaches from the North Pole to outer space. 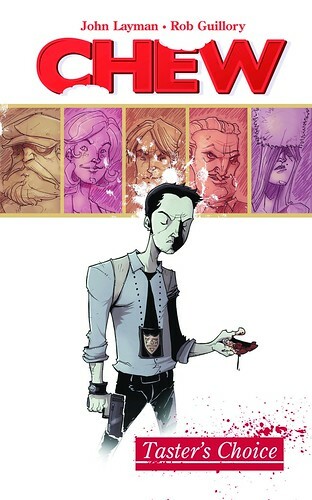 Why Read it: Chew effortlessly sets the scene for an alternate America by changing one tiny detail about how we live that is totally brilliant and follows the logic of that detail the way out to the moon and beyond. And it's really very funny, to boot, and a little bit gross, and super clever. It's also a really great example of the integration of art and story that makes comics the rich and versatile medium that it is. Guillory's style is cartoonish in a way that may not be for everyone, but adds little nuances, details, and Easter eggs that enhance the prose that Layman provides. Bonus: Food. Granted, given his powers and his position as a cop, Tony eats a lot of things that are...unpleasant...by any definition. But! There are many more food-related powers in this universe, as it turns out, and as a food-loving lady it is exciting to learn what they are - and the inevitable consequences of each of them. 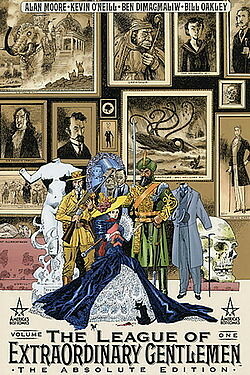 Plot: There are several books in this series now, but the gist is that several figures from literature (originally Victorian literature, but the scope was later expanded) are brought together to form a super-team ala the Justice League. Characters like Captain Nemo, The Invisible Man, and Mr. Hyde fight off alien menaces, expose government corruption, and generally get up to all sorts of hi-jinks. If you're familiar with the other work of Alan Moore, such as Watchmen or V for Vendetta, you can probably guess that this league is a bit more controversial than the ol' JLA. Bonus: Feminism. One of the things that drew me so much to this book is that the group is led by Mina. She gathers the bunch of misfits together, she tells them what to do, and they listen to and respect her (for the most part). And she does it all in a high-necked, flouncy Victorian dresses. Why Read It: Okay, so this book isn't technically "ongoing." It ran from 1994 to 2001. But! It is absolutely one of my favorite series of all time, so I'm sending you forth to read it anyway. The story is a familiar one - the reluctant hero finds his way - but Robinson has such a good ear for story and dialogue that it feels new again. This was one of my earliest introductions to superhero comics (I was more of an indie kid) and the book is also a great way to learn about some of the less-known characters of the DC universe. The art by Tony Harris is gorgeous, too, especially the skyline of Jack's home base, Opal City. Bonus: Elongated Man. What can I say, I love the Dibnys! So there you have it, three series I really enjoy. What books do you love? Tell us in the comments!